A Nigerian woman has run up a £330,000 bill for NHS treatment after she gave birth prematurely to quadruplets in a London hospital. The woman was taken ill on a flight from the US to Nigeria via Heathrow. It comes as a group of MPs have urged the government to take "urgent action" to recover more money for treating foreign patients. A Public Accounts Committee report says the system for recouping costs from overseas patients is "chaotic". 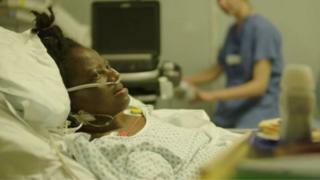 The case of the Nigerian woman is thought to be one of the NHS's biggest unpaid bills for an overseas patient. The woman, who is included in the BBC Two programme Hospital, was due to give birth in the US, where she has family, but had been turned away for not having the right hospital paperwork. She was taken ill on her flight home to Nigeria and ended up in St Mary's A&E, which covers Heathrow after her flight stopped over at the airport. Priscilla was three months away from her due date. She gave birth to one baby who died and she and her three children were all placed in intensive care. Another of her children died on Saturday and her two surviving children remain in intensive care which costs £20,000 a week per child. Priscilla was released from hospital after six weeks and is being supported by a charity as she has no family in the UK and admits she has no ability to pay the bill. The NHS Imperial College Trust which includes St Mary's spent £4m on overseas patients last year and managed to recoup £1.6m. Treatment given in A&E departments is free to all, however, once you are admitted, even as an emergency, overseas visitors are chargeable. In October, it was revealed the government was expected to fall short of its target of recovering £500m a year from overseas visitors and the Department of Health "refined" its target for 2017-18 to £346m. Chairwoman of the Public Accounts Committee Meg Hillier attacked the government's "failure to get a grip" as "simply unacceptable". The Department of Health said it would be announcing "further steps very shortly to recover up to £500m a year". Ms Hillier, MP for Hackney South and Shoreditch, said the NHS was missing out on "vital funds". "The public rightly expects the government to enforce the rules, and more can and should be done to recover money," she said. The report calls on the Department of Health to publish an action plan by June, "setting out specific actions, milestones and performance measures for increasing the amount recovered from overseas visitors". Responding to the PAC report, a Department of Health official said: "This government was the first to put measures in place to make sure the NHS recoups money from people who are not eligible for free care. "Some hospitals are already doing great work, and the amount of income identified has more than trebled in three years, to £289m. "However, there is more to be done to make sure that if people are not eligible for free care, they pay for it. "We will be announcing further steps very shortly to recover up to £500m a year by the middle of this Parliament." Hospital trusts in England are legally obliged to check whether patients are eligible for free non-emergency NHS treatment and to recover any costs. The report identifies the biggest challenge to recovering costs as the lack of a single easy way to prove whether patients are entitled to healthcare. The committee notes that while some trusts are now requiring patients to prove their identity by showing passports and utility bills, these documents do not demonstrate entitlement to free NHS care. Some patients, such as refugees and those applying for asylum, are exempt from charges. The report says the Department of Health should build on existing systems, such as the NHS number and electronic patient record. There are currently large variations between trusts in the amounts they charge and the debts they recover from overseas patients. The committee says that trusts' performances should be shared and there should be intervention if a trust is falling short. And while GP appointments are free to everyone, the report says GPs could do more to help and the government should give clear guidelines on what is expected of them. Dr Mark Porter council chairman for the British Medical Association, said: "It is important that those accessing NHS service are eligible to do so and that we recover the costs for treating overseas visitors. "The systems to do this need to be practical, economic and efficient and must not jeopardise access to healthcare for those who need it. "Any charging systems should not prevent sick and vulnerable patients receiving necessary care, otherwise there may be serious consequences for their health and that of the public in general." Video Should NHS patients have to show their passport?